N.H.O. 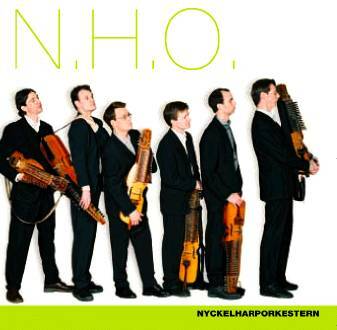 is a CD consisting entirely of new music for nyckelharpa, composed and arranged by members of Nyckelharporkestern. Never before has such a collection of music been written and arranged specifically for a nyckelharpa ensemble. N.H.O. is the result of a single-minded effort to explore the possibilities of the nyckelharpa and create new music for the ensemble repertoire. Six of Sweden’s foremost nyckelharpa players play in Nyckelharporkestern. As an ensemble and as individual musicians they have played a major role in the development of the nyckelharpa, for its popularisation in modern times, and have been a great source of inspiration for many nyckelharpa players, not only in Sweden, but also around the world. Individual guest performances in a popular music context with groups such as Nordman and Sarek have made the nyckelharpa a familiar instrument for the Swedish general public. The interplay within Nyckelharporkestern has developed continuously since the group was formed in 1994. The musicians have been active in developing new variants on the nyckelharpa to facilitate dynamics within ensemble music. It is clearly a new field of application for the nyckelharpa, but historically there are many interesting parallels. The desire to experiment, technical innovations and the curiosity to adopt new musical influences seem to have affected makers and players of the nyckelharpa throughout the ages. Looking back a hundred years once can see that the nyckelharpa has undergone a process of continuous change. The oldest known form, the Moraharpa (from the 16th century) differs considerably from the nyckelharpa of today and during the 18th and 19th centuries development was carried forward to new models such as the kontrabasharpa and the silverbasharpa. The triple-rowed chromatic nyckelharpa, as it looks today, constructed so that one can play in all the keys, first saw the light of day in the early 1900s, and as time passes other inventive instrument builders come along with improvements in the construction and variations on the instrument. Creativity appears to have been just as great when it comes to the repertoire. In the 19th century Byss-Calle (1783-1847) earned a reputation as a great composer of tunes. The foremost nyckelharpa player of the 20th century, Eric Sahlström (1912-1986), early on exploited all the new possibilities offered by the chromatic nyckelharpa. He created a personal style based on the repertoire he had acquired from elder nyckelharpa players, tempered with influences from contemporary popular and classical music. Today, both Byss-Calle’s och Eric Sahlström’s tunes form part of the basic repertoire for many nyckelharpa players and are considered to be an important part of the nyckelharpa tradition. Nyckelharporkestern are active within the same dynamic tradition, both in terms of experimenting with new instrument models and in terms of writing new music. Some of the instruments on this record have been developed to create a new dimension for playing together on nyckelharpa, for example the. octave- and alto- nyckelharpa. The same thing applies to the repertoire. Some of the tunes on N.H.O. sound like older tunes, others conspicuously bear the stamp of the present. The repertoire is, as it always has been, a mixture of new and old and the tradition therefore continues along its windy path. Everyone and yet no one controls its destiny, and no one knows where it will go next.